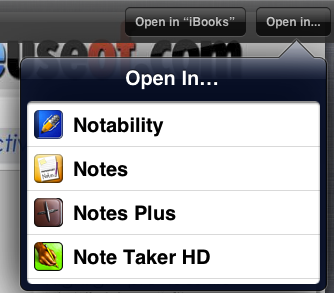 Opening iPad PDF Files – Is Your Favorite App Missing from the “Open In” List? A few months back, I wrote an article on How to Load and Open ePub & PDF eBooks On Your iPad. 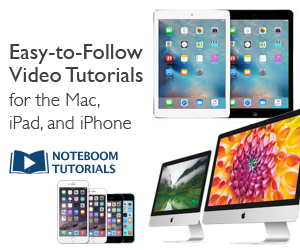 There are dozens of apps that can open PDF files, including Apple’s own iBooks. However, having more than ten apps on your iPad that can open PDF files can be a problem. When you add too many apps that can open the same file type, such as PDFs, you may find your favorite is no longer a choice when opening a new PDF. The app you’ve been using for months is suddenly and strangely missing from the “Open In…” list. Instead, you find some other app (or apps) are now on the list. I ran into this problem myself several months back and today saw a question about it in a forum post. Here’s the explanation. There is a 10 item limit in the “Open In” list. New apps you install that can open the same file format (eg. PDF) bump older apps off the list once this limit is reached. So that favorite PDF app, the one you’ve been using the longest, the one that was early on the list, may get pushed off. You may not even realize you’ve added another app to your collection with the ability to open PDF files. You may have added the app for another purpose and didn’t know it would open PDFs. The best solution is to delete these extra apps from your iPad. Choose to keep only those you will use. That’s what I had to do. I simply had too many apps that could open PDFs. Here’s another solution, but take care if you try it. Since the most recently installed app takes precedence, you can delete and reinstall your favorite to get it back to a prominent position on the list. Just remember you may have data attached to the app, so be careful if you choose to reinstall it. Make sure you have a recent backup of apps and data in iTunes on your computer or in iCloud. Preferably both. You need to do them one at a time. Hi Ken. I believe goodreader has a “manage files” section which allows u to select more than one file and then email. GreggA recommends a very useful app, one of the first you should get for your iPad. You can zip together a number of files from within GoodReader. Unfortunately Ken, your PDFs are inside iBooks right now. A solution may be to put future PDFs inside GoodReader where you have more options for post processing and sharing. You could email each of the PDFs to yourself from within iBooks, tap to open the PDF inside mail, then choose to “Open In…” from the action icon (box with arrow). You can send each pdf to GoodReader where you can bundle then together as described above. ← Apple iPad Went on Sale Two Years Ago Today – Were You Waiting? In Line?